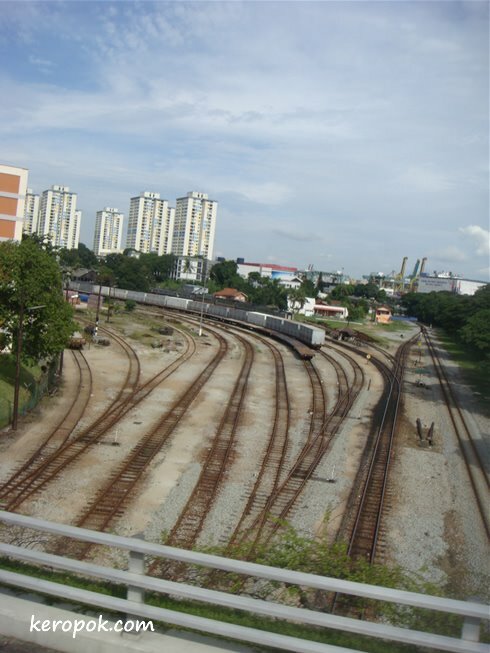 A view of the Malayan Railway tracks in Tanjong Pagar, Singapore. These tracks will one day connect Singapore all the way to Kunming in China, passing through Malaysia, Thailand, Cambodia and Vietnam. That is a revelation. I never connected Singapore with railroads. Shows how dumb I am. Hello from New York! I love trains. Thanks for taking that great picture. hey i love that view! Everytime I'm on the bus and passing by there, I would look out of the windows and see. I haven't ridden on the KTM before though. It's much faster to go to KL either by car or plane than train. I had the opportunity to ride in the train from Tanjong Pagar up to Kluang in Malaysia. A kind of a laid-back travel without the rush of vehicles while enjoying the slow pace of life at the various train stops. There is a suggestion by YTL SDN BHD to make bullet train from Singapore to KL but rejected by KTM and Malaysian government the reason is to protect KLIA and loosing flight to Singapore by Air Asia, SIA, MAS and Firefly. I prefer to have bullet train to Singapore from KL because cut cost than having a flight due to airport tax and waiting so long. Malaysian so afraid of competition and always depend on government also very kiasu. If bullet train is available. Singaporean and Malaysian travel safer and if any flight missed in both Changi and KLIA, go for exchange just one half hour to both destination. It's actually benefit on both country but Malaysia is too kiasu on KLIA.